but when I think of Fire Trucks, I think of RED! The Fire Station Tour that our Daisy Troop visited this week deserved a little love and thanks for spending their valuable time and energy with us. 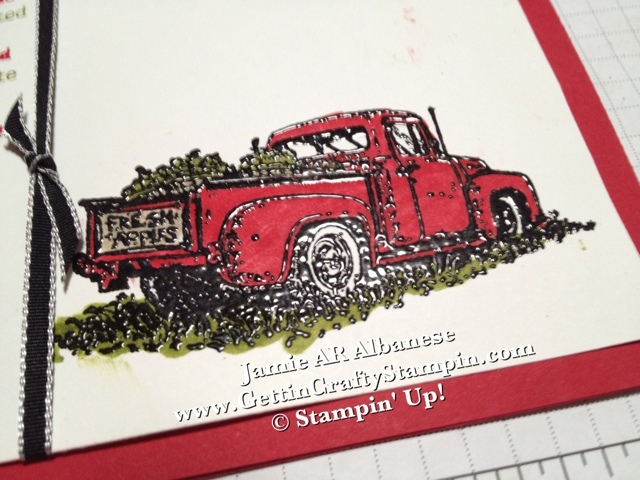 With a Real Red card stock base I heat embossed with Black embossing powder this truck. 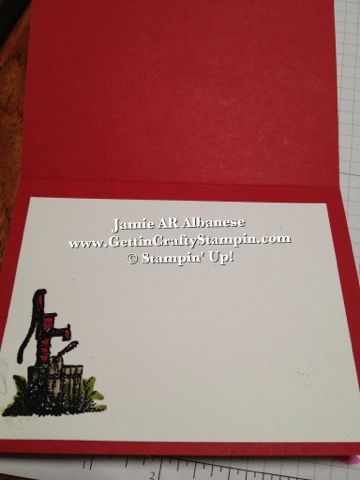 Using the Real Red, Crumb Cake and Old Olive Stampin' Write Markers to color in with vibrant but coordinated colors. Using the same Markers to color in the sentiments on Stack of Wishes Hostess Stamp set from the Spring Mini ties in the feel while expressing the gratitude we had. Tie In the Black with our Ribbon! I simply adhered a strip of ribbon across the card and tied a knot from a dash of left over - an easy and fun different look! 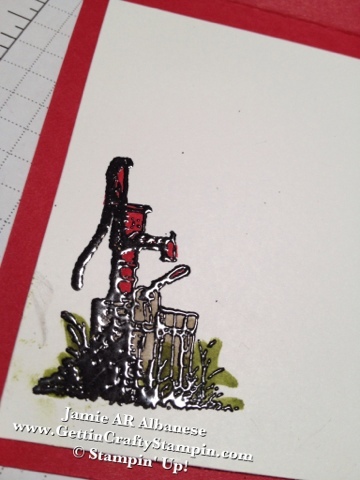 Heat Embossing and Marker coloring in on the inside a water pump is a little funny for the firemen. The Heat Embossing is a sharp and glossy look and the Markers Color in with Vibrant colors! are important to appreciate. I'm so glad they took time out of their schedule to be with our troops from school. How can YOU show your Gratitude and Love? Tomorrow is National Send a Card to a Friend day!! Do it TODAY! Send a Card to those you love and appreciate! Look into our amazing sentiment stamp sets... many combine all of your needs for holidays, celebrations and more! Grab a few and, as I always recommend, one or two designs that you like - then you can create a card for anyone! we offer a HUGE variety of top of the line stamps! save 10% when you pick me as your demonstrator!